Press garlic cloves through a garlic press into a medium bowl. Mash the garlic and salt together. Add lemon juice, olive oil and parsley. Drain and rinse the fava beans. Place beans in a large cooking pot over low heat. Add garlic mixture; stir to combine thoroughly. Cook and stir until heated through, about ten to fifteen minutes. Arrange mixture on a platter and serve. Suggested Garnishes: Radishes, hard-cooked eggs, chopped scallions, or toasted pita bread cut into wedges. *Ful Mudammas image (C) Abdullah Geelah (2006). Used under the Creative Commons Attribution 3.0 Unported license. 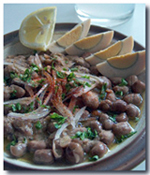 Similar recipe: Fuul (Sudanese broad bean paste).